On Wednesday Mexico will auction rights to explore for oil in 14 shallow-water blocks in the Gulf of Mexico. The winning bidders will sign production-sharing contracts with the government. This is the biggest economic moment for Mexico since the 1993 signing of the North American Free Trade Agreement. Allowing companies to take ownership and profit from their oil and gas production breaks a 55-year Mexican prohibition on private participation in energy. Yet plenty of pitfalls lay ahead. The downward trend in oil prices has raised questions about whether the level of investor interest will be enough to make the first tender successful. The biggest risks lay with Mexico’s weak rule of law and uncertain property-rights. 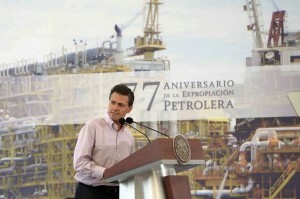 President Enrique Peña Nieto of the Institutional Revolutionary Party (PRI) has spent serious political capital to reform the constitution to end the government’s energy monopoly with its state-owned oil industry Petróleos Mexicanos (PEMEX). Recently Nieto has portrayed himself as a pragmatic president eager to make a name for himself. – He found reformist allies in the rival, market-oriented National Action Party (PAN) in congress. – He passed the Hydrocarbon Law, allowing for production-sharing and profit-sharing in oil and gas on August 11, 2014. Mr. Peña Nieto’s legacy as a path breaking reformer is at stake if he can’t surmount special-interest roadblocks to energy modernization.